“When you visualize a successful CEO’s office, do you see a messy, clutter-filled office with so much paper work piled up you can’t even see the top of the desk? Or do you see a spacious, clean, simple office with an organized desk and a big, shiny workspace? Now look around your own office and desk. 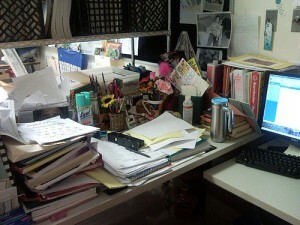 Does it look like the successful CEO’s office or is it a clutter-filled mess? Schedule a few minutes at the end of each today to put back what you have taken out (i.e. files, office supplies, etc). Tip #6: Use the 3D technique with snail mail: Deal with it, Delegate it or Dump it! PS. The 3D technique also works well when dealing with email. I need to add ‘clear the clutter off my desk’ to my to do list everyday! My feeling exactly! I learned this a long time ago. One of the best lessons EVER!